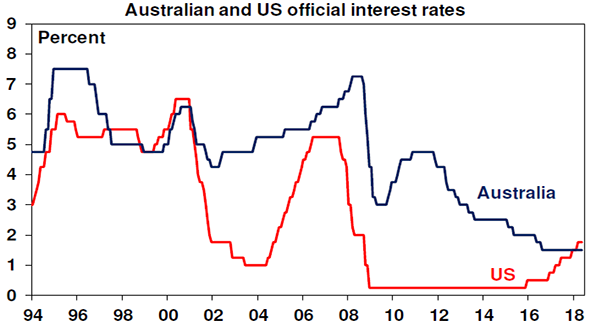 First, growth is likely to remain below RBA expectations. A bunch of factors will help keep the economy growing: the drag on growth from falling mining investment is largely over; non-mining investment is rising; infrastructure investment is booming; and net exports should add to growth helped by strong global conditions. 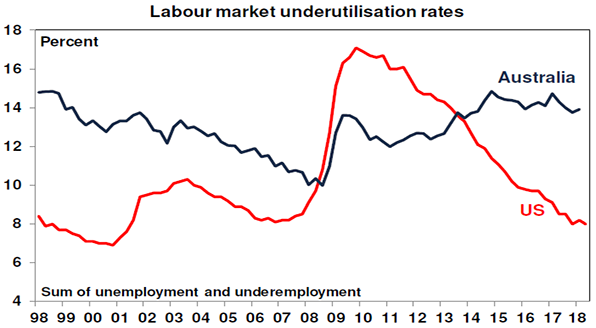 However, against this, housing construction is slowing and consumer spending is constrained with downside risks around slow wages growth, high debt levels and falling house prices in Sydney and Melbourne. Personal tax cuts likely to be tabled in the Budget will help keep the consumer going but are unlikely to offset all the drags. So while growth will likely improve from the 2.4% pace seen last year, it is likely to be to between 2.5% and 3%, below RBA expectations for a pick up to 3.25%. we see prices in Sydney and Melbourne falling another 5% this year, another 5% next year and with further slight falls in 2020. 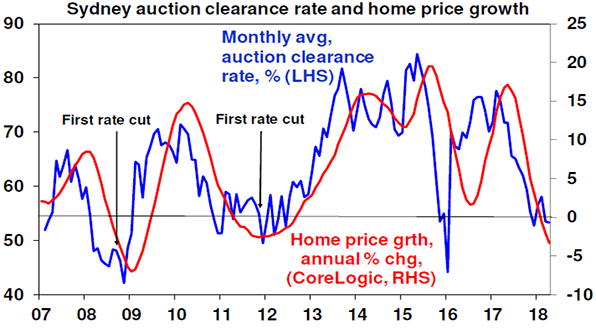 We are running around levels for price growth and auction clearance rates that in the past have been associated with the start of interest rate cutting cycles (in September 2008 and November 2011 – see the previous chart), not rate hikes! The risks of a sharper fall in prices if investors lose faith, homeowners decide to reduce high debt levels and if the shift from interest only to principle and interest for many borrowers over the next few years creates problems needs to be allowed for. Raising rates when prices are falling will accentuate these risks. There are two main pressures at present. 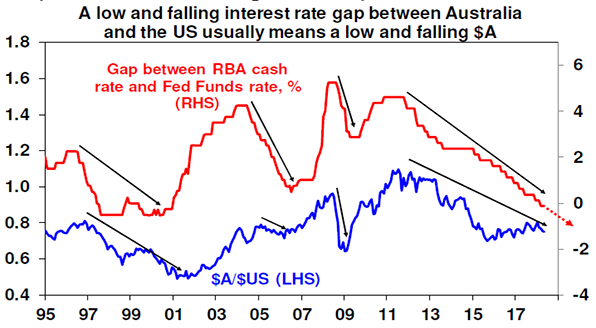 The first is a rise in money market funding costs in the US and Australia of around 0.3 to 0.4%. Given that only 10-15% of bank funding comes from this source its unlikely to have much impact. And the banks are unlikely to pass on the extra costs to owner occupiers on traditional loans given the Royal Commission, but banks could raise rates for investors and interest only borrowers. Higher US bond yields could also place some pressure on bank funding costs but again this is likely to be modest, and probably unlikely to result in higher rates for owner occupiers on traditional loans. 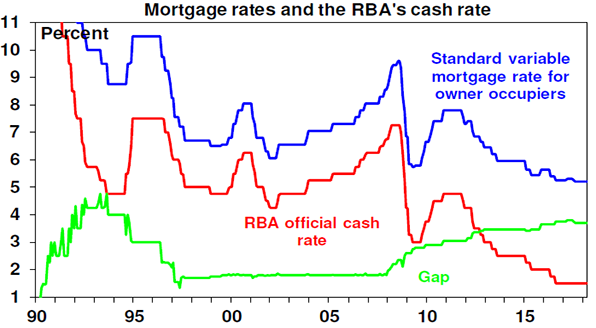 The main thing for traditional borrowers to watch is the cash rate. If we are right, such borrowers will see pretty stable mortgage rates out to 2020.